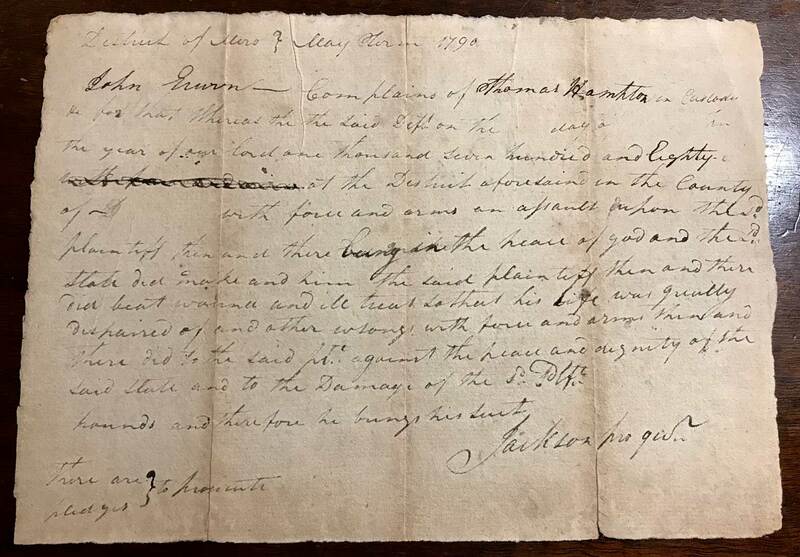 Excellent President Andrew Jackson legal document for the "May Term 1790" completed all in his hand and signed with last name only "Jackson pro quo". Last one of the group I had and I hate to part with it but I can't keep it all! In very good condition, it measures 8" x 5 3/4", written on old brown paper with period ink. The document is dealing with legal issues in the Nashville area. "About this time the government opened a road from North Caro- lina to Tennessee, and John McNairy, a fellow-law student, having been appointed judge of the Cumberland district of Tennessee, persuaded Jackson to go west with him. They arrived in Nashville in 1788. As there was only one other "lawyer" in the town at that time and that lawyer had been retained by an association of lawless debtors, Jackson found employment immediately. Within one month after his arrival it appears by the court records that he procured to be issued seventy writs against these delinquents, and that he brought all of his cases to trial. Of the 192 cases on the docket of the Quarter Sessions at the April Term 1790, Jackson was attorney in 42. In one day of 1793, thirteen suits were entered and Jackson was attorney for the plaintiff in all of them. At the same term he appeared as attorney in 75 of the 175 cases docketed, and at a subsequent term, in 60 out of 132. Of the cases tried in 1794, he conducted 228 out of a total of 392. (Brady's Life, p. 40.)"